Dental coverage can help provide for the common expenses associated with dental work. Here's what you need to know when choosing a dental insurance plan. The American Dental Association recommends visiting the dentist twice a year for a checkup. Dental insurance can help offset the costs of these checkups. Not only that, if you need other work done to your teeth, your dental insurance plan may cover some or all of the costs. There are two major types of dental plans: managed care dental plans and fee-for-service plans. Managed care dental plans place limits on the services that are covered, the amount paid for those services, and the dentists you can choose. Fee-for-service plans reimburse patients based on the amount that’s spent on dental care. Note this is different from managed care plans, which base payments on the type of service that’s provided. Patients can choose any dentist, but they’re typically required to pay for services upfront. Then, employers reimburse the employee a percentage of the treatment. 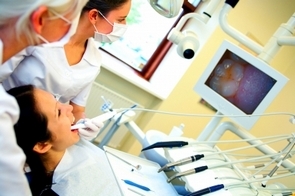 There may be an annual limit on the amount of dental coverage an employer will reimburse. Preferred Provider Organization (PPO) programs are a type of managed dental care plan that have a network of dentists and dental providers. Much like health insurance PPO plans, some PPO dental plans will allow you to receive treatment from a dentist outside the network, but you’ll have to pay higher deductibles and co-payments for those services. Dental Health Maintenance Organization (DHMO) plans are another type of managed dental plan in which subscribers don’t pay anything for certain types of treatments. Other treatments may only require a co-payment. The plan itself has a number of contracted dentists who are paid a fixed amount based on the number of individuals and families enrolled in the plan. When you’re choosing a dental insurance plan, there are some things you want to consider. Will you be able to choose your own dentist? If you already have a favorite dentist, make sure his/her services will be covered by the dental plan you choose. Your plan might allow you to choose any dentists you like, or it may restrict your choices to a list of dentists. What services are covered? At the very least, you should be able to receive two annual checkups at no cost. Find out what other services are covered and how much you would be responsible for paying. How much will you pay? With managed care plans, you’ll be responsible for a monthly premium and possibly co-payments at the time of service. Make sure you understand the total cost of your dental plan. What major dental work is covered? These types of services are the most expensive. Find out how much, if anything, will be covered by your dental insurance plan if you have to have major dental work done. Watch out for least expensive alternative treatment (LEAT) clauses. Some dental insurance contracts will only pay for the treatment that costs the least amount of money, even if you and your dentist agree that a more expensive treatment is the best option. Some plans use a usual, customary, and reasonable (UCR) type of analysis to figure out how much they will pay for certain dental services. The UCR limits on certain plans could be rather low compared to the price charged by area dentists, increasing the amount you have to pay for services. Often, dental insurance doesn’t fully cover treatment, even those recommended by the dentists. There may be gaps between what dental services costs and what your insurance company is willing to pay. Try to choose a dental insurance plan that covers as much as possible to reduce the amount you have to pay out of pocket for dental services. Next articleDo You Need Long Term Care Insurance?